Zoom is a web conferencing solution that provides screen sharing, meetings, live chat, and a lot more. Joining a meeting in Zoom is very simple. You can also join a meeting from the browser, by entering the Meeting ID number at https://langara.zoom.us/join. You can log in to Zoom at https://langara.zoom.us, using your Langara Federated ID (e.g. jsmith00@langara.ca). 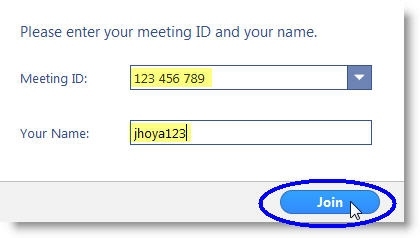 Once you are signed in, you will have access to your account settings and be able to create meetings. All Langara staff and students have a Basic Zoom account. Meetings created by Basic accounts are limited to 40 minutes. See https://langara.zoom.us for more information on creating and hosting meetings. After following one of the steps above to join the meeting, Zoom will attempt to start the meeting. After you click “download & run Zoom,” you will see a “Save As” window appear. Click Save to download Zoom to your computer. Once the download is complete, click on the downloaded installation file in your browser to run it. 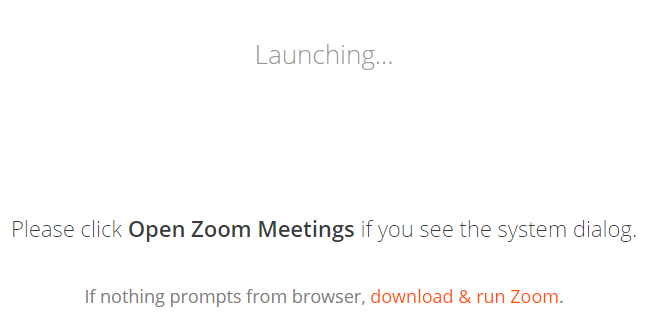 At the end of the installation, Zoom will launch and invite you to join a meeting. 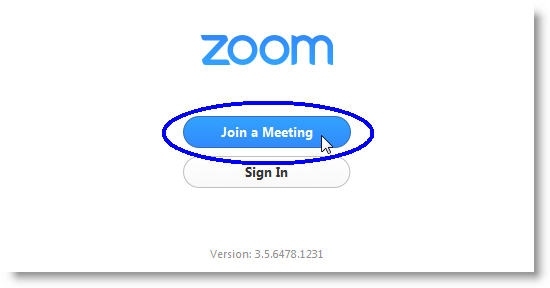 Once Zoom is installed, you will see a window inviting you to sign in or join a meeting. 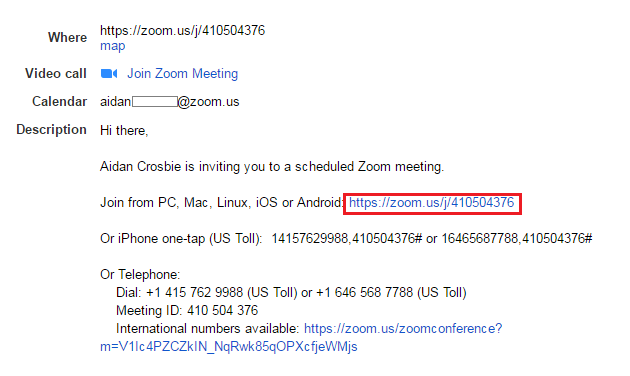 Click “Join a Meeting.” Zoom will open. In the next window, enter your name (this is how your name will appear to other people in the meeting) and the Meeting ID, if applicable. If you have arrived to the meeting early, you may see the following window, asking you to wait until the host arrives. 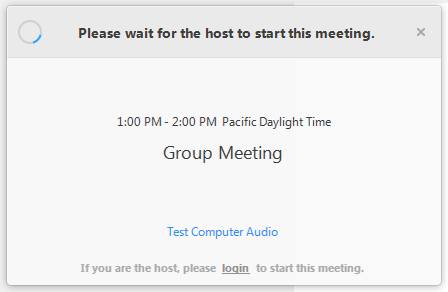 When the host arrives, the meeting will start automatically. In the meantime, you may wish to test your computer audio. When you join a Zoom meeting for the first time, you will be asked how you want to join the meeting audio. 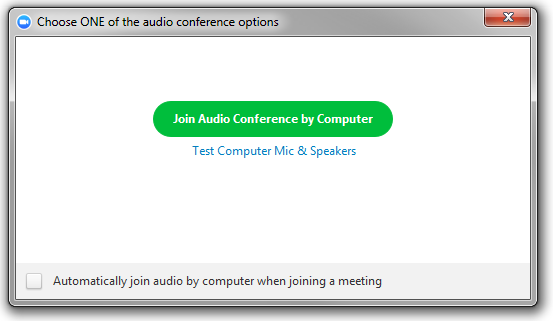 To join using computer audio, click “Join Audio Conference by Computer.” This option will use your default microphone and speakers. In the Test Computer Audio window, use the Test Speaker and Test Mic buttons to test your audio setup. Click the Test Speaker button. If your speakers are working correctly, you should hear a series of musical notes. 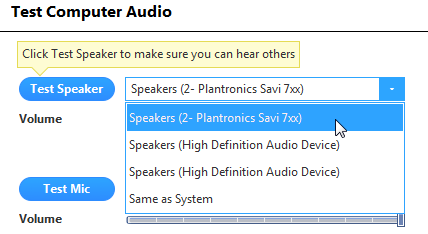 If you don’t hear anything, try switching speakers in the dropdown menu. Note: For the best sound quality, headphones are strongly recommended. If you don’t hear anything when playing back, try switching microphones in the dropdown menu. You may also use a webcam in Zoom meetings, so that other people in the meeting can see you. In the Settings window, click Video to view a preview of your live image. If you don’t see anything, try switching cameras in the dropdown menu. When you are finished testing, click the X in the top right corner of the Settings window to close it. You can mute your microphone or webcam at any time during a meeting. Just click on the appropriate buttons in the bottom left corner of the Zoom meeting window. Note: If Screen Sharing is being used, you can access these same controls by hovering over the Screen Share tab at the top centre of the screen. In Zoom, both the host and attendees (when granted permission by the host) can share their screen with the meeting. Just click the Share Screen button. 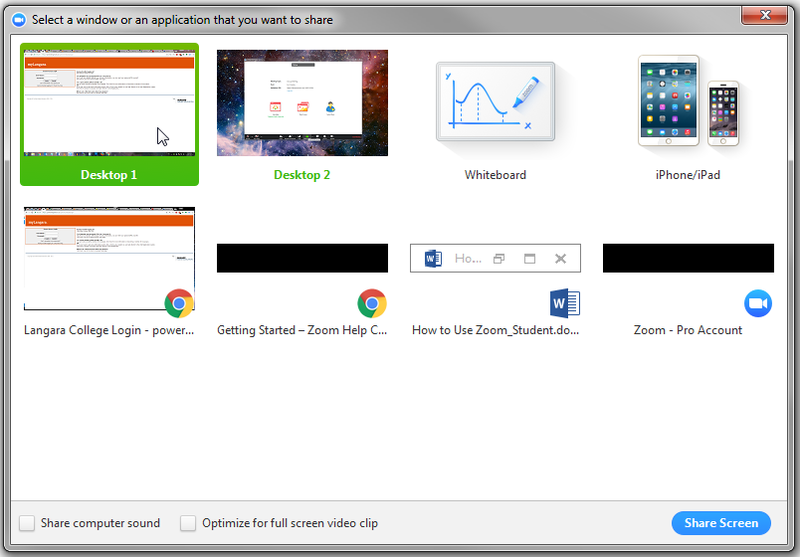 Select which window you want to share, or click “Desktop” to share everything on your screen. You can also select “Whiteboard” to create a whiteboard space where you and others in the meeting can interact. When you’ve made your selection, click the “Share Screen” button. Note: If you are sharing audio or video content from your computer, make sure to tick the “share computer sound” and “Optimize for full screen video clip” boxes at the bottom of this window. During Screen Share, the controls will move to the top of the screen. When you’re finished sharing, click the “Stop Share” button. In Zoom, you can chat with everyone in the meeting, or privately with specific user(s). Under the “To” dropdown, choose the recipients for your chat and type your message. Press Enter to send. If enabled by the host, the Chat tool’s File Transfer feature allows you to share files directly with other people in your meeting. Under the “To” dropdown, choose the recipients for your file. Click the More link and select Send File. Navigate to the file on your computer and click Open. The file will send automatically. A download link to the file will appear in your recipients’ chat windows. To receive a transferred file, just click the link that appears in your Chat to download the file. Zoom is installed in all Citrix labs on campus, but can only be used to watch and listen; microphone and webcam functions are not available. If the meeting host has enabled the chat tool, the chat function is also functional. 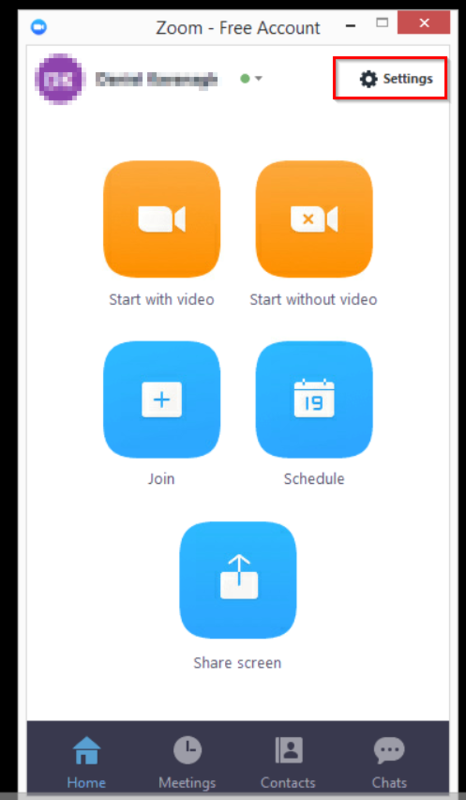 Though a wired Internet connection is recommended for the best audio and video quality, mobile (both iOS and Android) and browser versions of Zoom are available. Not all versions offer the full set of features.